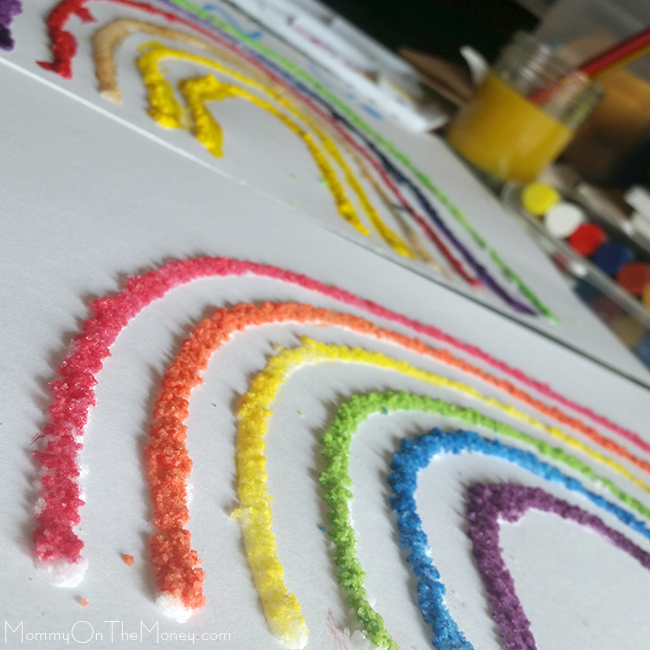 I wanted to do something fun with a rainbow with the kids last week for St. Patrick's Day. We are still abroad so it needed to be something really simple with materials we had in a very small craft stash. 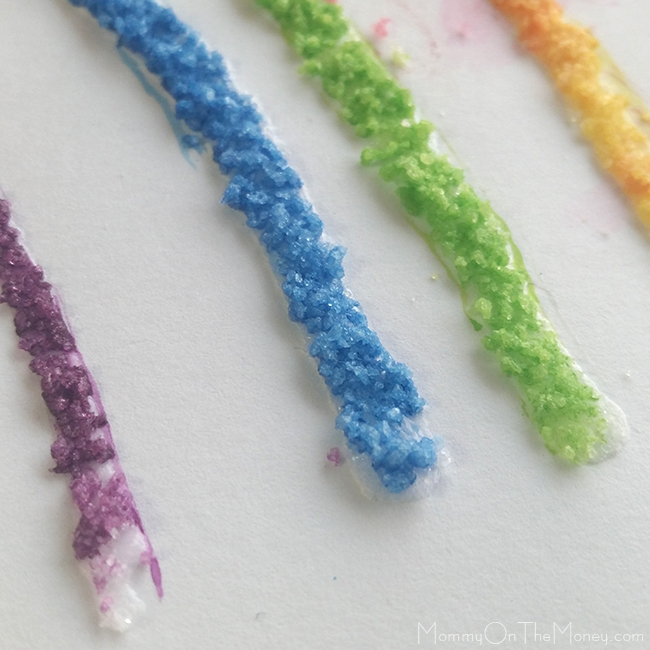 I came up with a salt painting craft rainbow we could create with the watercolors, paper, white glue and salt which we had on hand and they had a blast! This craft doesn't even have to be for St. Pattys. 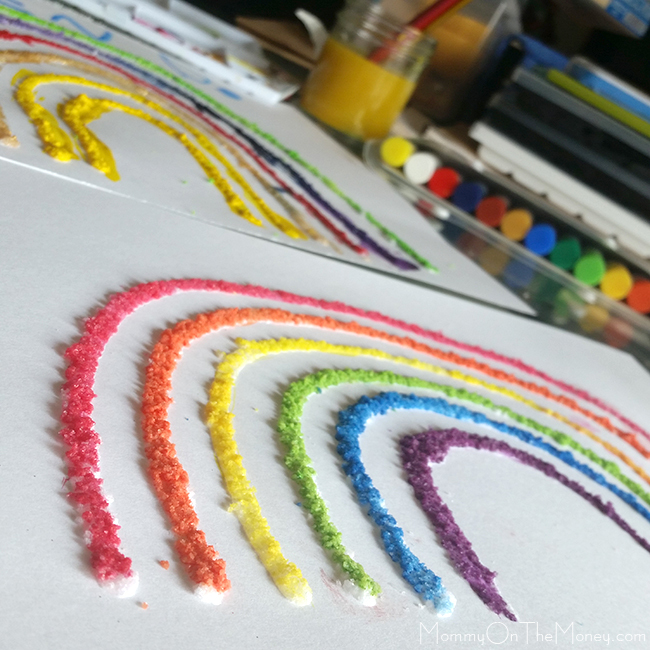 Rainbow crafts are great for springtime or anytime. 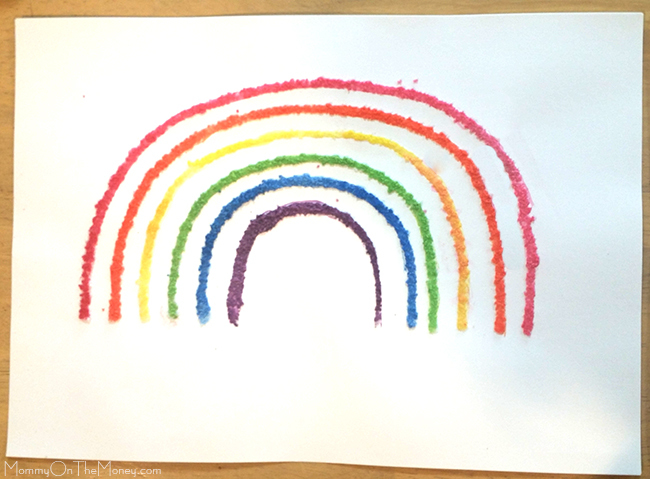 Just make sure you do the rainbow with the glue ahead of time. Kids don't like to wait for it to dry. * If you make a purchase after clicking a link in this post I may receive a commission. I squeezed out the archs of white glue on the watercolor paper myself the night before and covered them with salt. Then I left it overnight to dry. 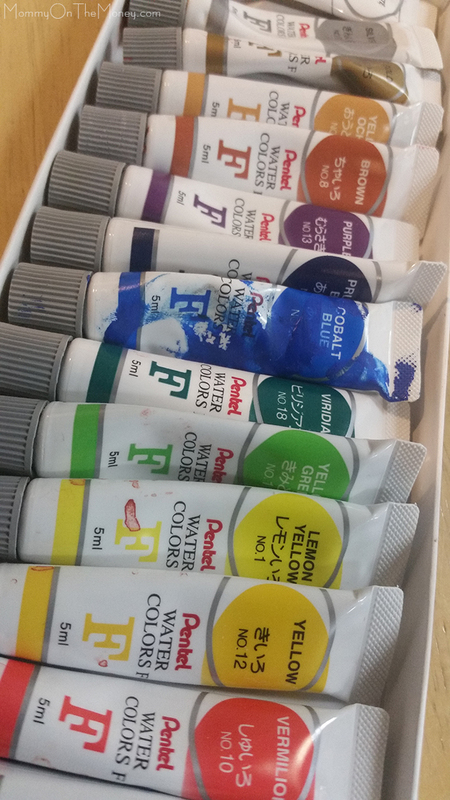 Here are the watercolors we used with water added in our palette but I don't see any reason why you couldn't use the dry ones that you add the water to as you use them. 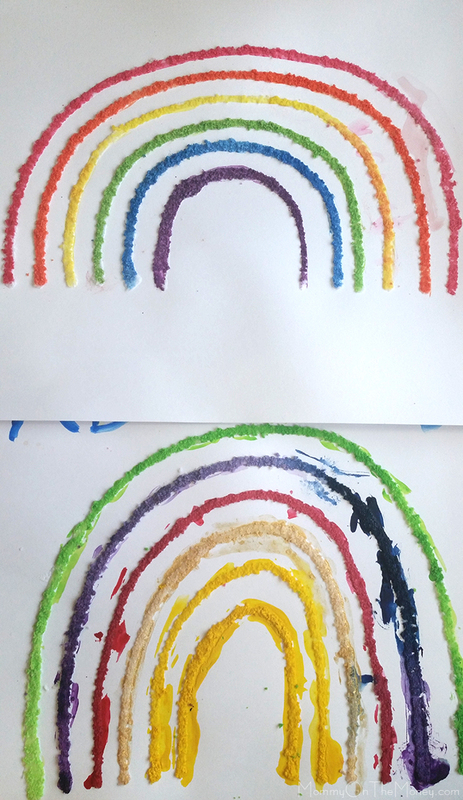 I made two of the prepared salt rainbows but I realized right away the at the 2 year old had no interest in following the rainbow and wanted a plain piece of paper to paint on and the 5 year old didn't want to do the colors in rainbow order so I painted one myself! The bottom line is that we all had fun! 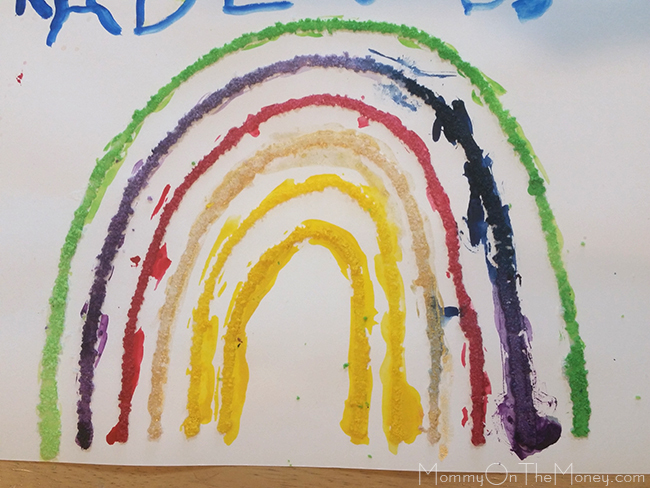 Ahead of time - parents can draw out the rainbow with white glue. Either draw it out first in pencil or simply freehand. Then pour your salt on top and shake off. I used sea salt so it was a little thicker and took me a couple pours to get it all filled in. Once dry, give kids something to use as a pallet, or some type of plastic container. Add water to tiny drops of paint. 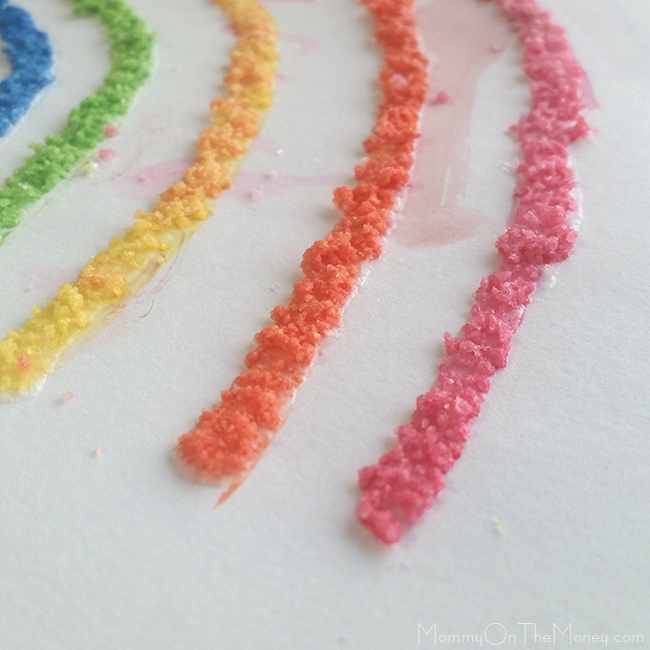 The fun part of this craft is seeing the colored water spread through the salt right from the brush. 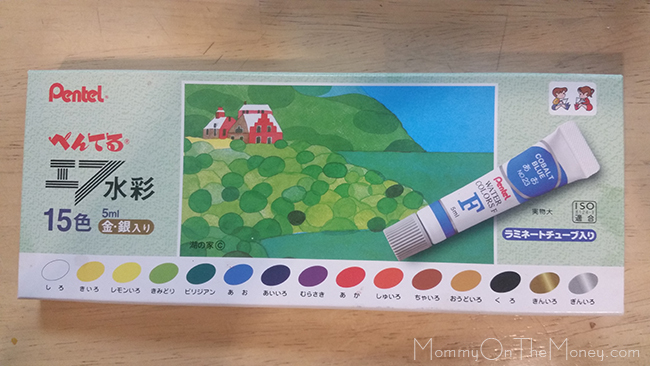 This will work with the dry watercolor paint where you actually rub them with the wet brushes to activate as well.